Description: A low protein Italian pasta shaped like little thimbles. This versatile shape can be used as the base of any dish. Bake it, stir it into soups, or create great salads and stir-fry dishes. 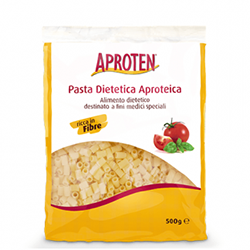 The Aproten line of pastas are also wheat/lactose-free and low in salt and potassium, making them suitable for individuals with renal diseases as well. Favorite Pasta of All TIME! From Anonymous of Sandpoint, Idaho on 1/19/2016 . From JenwCrowe of Philadelphia, Pennsylvania on 6/3/2010 . From Michael McDonald of Fuquay Varina, North Carolina on 7/16/2005 . 5/8/2006 – I need this item sooner than the month you say it will take for you to have it in-stock again. Can you recommend another . . .
7/29/2004 – how much phe is in a cup of cooked pasta?